The December BAD!SLAM!NO!BISCUIT! will be at the special time of the 2nd Wednesday of December. So bring your words, your audience, your judges, your to do lists, your fridges, your poems, to The Phoenix Pub for prizes! Because we give you a stage, two microphones, two MCs, The Master of Conflict, The Score Adder, The Sacrificial Poet and 2 Minutes on stage for Prizes. Burlesque strong-woman Penelope Asterisk is guaranteed to be able to bench press not only more than any poet can, but likely all the poets in the Phoenix. A writer, musician and general dilettante, Tom has been all these things since he was ten. Now twenty-eight his career as a writer, musician and general dilettante turns eighteen. Happy birthday to you, miserable life! So join BAD!SLAM!N!OBISCUIT! 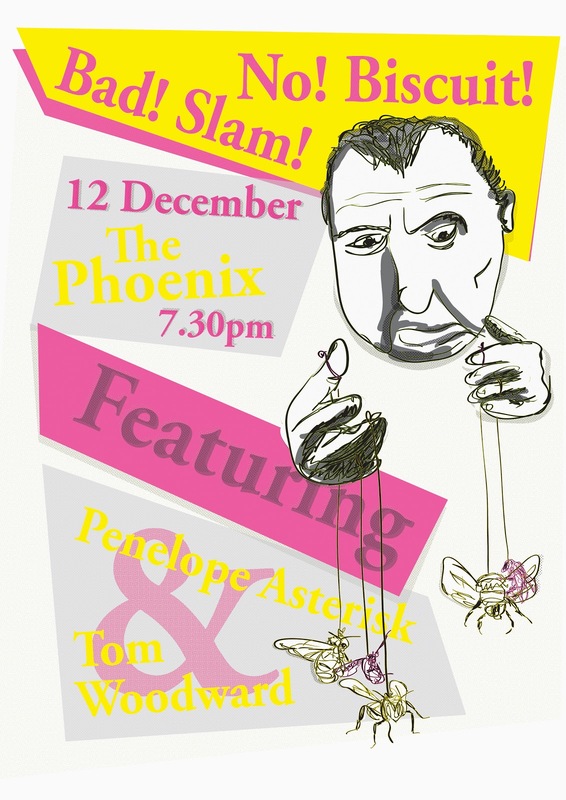 on the 2nd Wednesday of December for the final poetry slam of 2012, for prizes, for glory, for stanza, for the sacrifice of it all, there will be bourbon, oh Bad!Slam! knows there will be bourbon.